It's here. With the overwhelming support from our Tutukaka Coast business community, a good number of Whangarei based businesses and the widespread endorsement from our local readers - thank you, we couldn't have done it without you! So yeah, it's been a fabulous ride this year, learning lots while making and publishing The Coastie every week since January and now making this "bumper" Summer Edition - thanks to our readers and advertisers it all came together in it's unique way, Coastie style. Already feeling curious how The Coastie may develop in 2013, we are planning to resume weekly publication in February. We are now calling everyone who would like to write or submit locally relevant material to please send it to us or simply make contact by email so we can consider publishing it in the new year as space and funds permit. 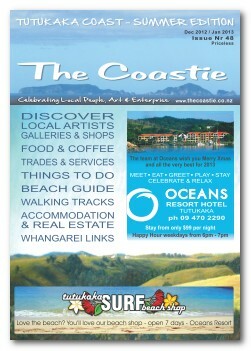 Please enjoy The Coastie Summer Edition & share it with your visiting friends. The Coastie will be also available in local outlets like shops, cafes, Oceans and the Tutukaka Holiday Park during the holiday period. Any feedback, criticism or suggestions are very welcome. Wishing you a Merry Christmas, a happy New Year and an awesome summer on the Tutukaka Coast!